11-16 Scion tC (tC2) RS Coilovers by D2 Racing D-LE-14. Scion tC2 D2 Racing RS Series Coilovers featuring 36-way damping and rebound adjustable monotube design, RS Series coilovers are perfect for the modified street car that also sees occasional track days. 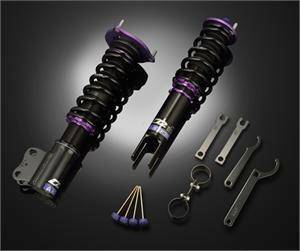 The D2 RS suspension kit is our most popular coilover. Featuring a 36-way damping and rebound adjustable monotube design, RS Series coilovers are perfect for the modified street car that also sees occasional track days. This coilover has separate height and preload adjustments allowing for optimal suspension tuning while maintaining full strut travel at all times.